This Under The Desk Elliptical made by InMotion is a great product that allows you to workout while you work! The tensioner allows you to easily adjust the resistance for a better burn. Weighing in at 31 pounds, the elliptical is heavy duty and measures 21.5 inches long by 12.5 inches wide by 14 inches high. The elliptical trainer tracks the number of steps, total minutes, distance, and estimated calories burned. As Featured On The Today Show on December 30, 2014! 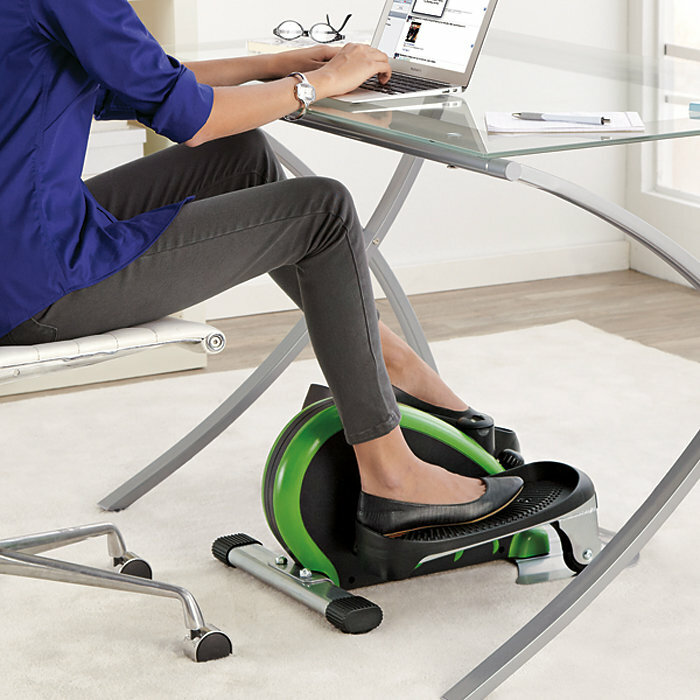 Why The Under The Desk Elliptical Is Awesome! 1. Everyone is trying to get healthy and there's not enough time in the day. This is a product that you can use while you're sitting down and working in the office or at home. People sitting at desks all day long are prone to more health risks, such as weight gain and cardiovascular disease. 2. Because you are using your legs, it keeps your hands free. You can do this while typing on a keyboard, talking on the phone, checking Facebook, or while drinking your morning coffee! 3. Instead of taking a 15 break to walk around the building, you can keep working while getting the same or even a better workout. 4. The Under The Desk Elliptical is a product you can use in spurts, not something you need to use all day long for it to be effective. However, some people cycle 12-14 miles per day on this and burn 500 calories. 5. It provides more of a workout than an adjustable desk or a treadmill desk, and it's also more affordable, which average $600. 6. It can easily be stored when not in use and hidden under your desk. This is great because if you have a treadmill desk, you're stuck with it! Your height and the height of the desk matters. To make sure the elliptical will fit your desk height: sit down at your desk with your knees bent and feet flat on the ground. If your feet aren't flat on the ground, lower your chair until they are. Measure the distance between your knee and the underside of the desk. If you measured 7 inches or more, you are fine and can get this thing with no problem. If you measured less than seven inches, take off your shoes and try again. If you are taller, this might not be comfortable under a desk because your knees will hit on the lift.